We’re winding down to the end of the year, and along with that, we’re at the end of the rope of Tales releases for 2014. 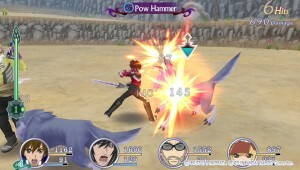 Tales of Hearts R is the third and final localization this year, after Tales of Symphonia Chronicles and Tales of Xillia 2, and it’s priming itself to be the next must own Vita title. And damn if it doesn’t make a solid case for it. 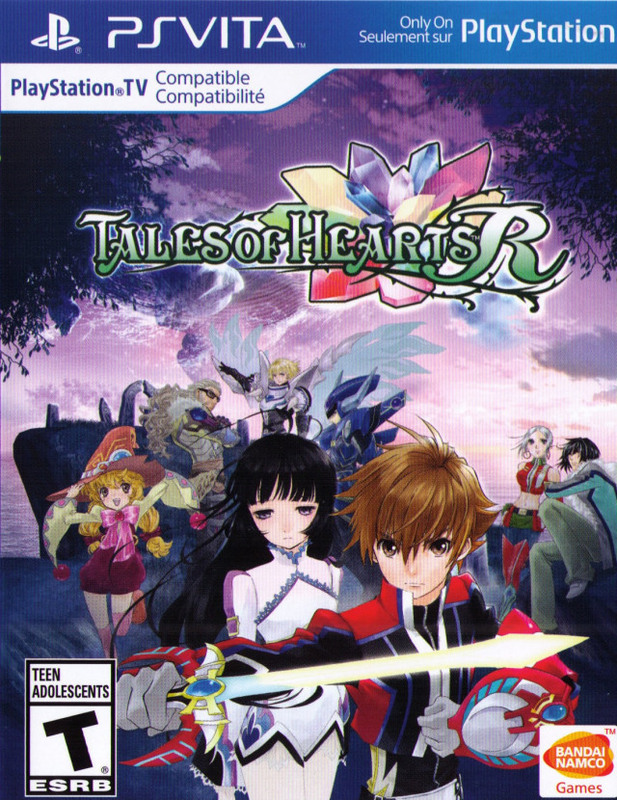 Tales of Hearts is the eleventh main entry into the Tales franchise and was originally released to Japanese Nintendo DS systems in 2008. Since then, it has been re-imagined for the PlayStation Vita hardware (hence the “R”). The fact that it was chosen for localization is a huge surprise, considering nearly every other Sony portable release has been passed up (save for the atrocious Tales of the World: Radiant Mythology). As a mothership title that has yet to see the light of day in the States, I’ll gladly take it. The game’s title is far more literal than you might expect, as human emotion plays a key role in nearly all aspects of the plot. Emotions take on a physical form called Spiria within people, and those with mastery of them can summon weapons called Soma. When mysterious creatures dubbed Xerom mysteriously appear and feed on the Spiria of the world’s citizens, they enter a zombie-like state known as Despir, which can only be cured by Soma-wielding Somatics. As you can see, the story has no qualms about throwing a textbook’s worth of terminology at the player, though fortunately it’s digestible without consulting any sort of glossary. A young man named Kor Meteor is one such Somatic-in-training who learns the art of Spiria mastery through his grandfather. 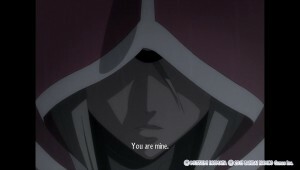 One day, he finds a young woman (Kohaku) and her brother (Hisui) washed ashore after they were attacked by the witch, Incarose. It isn’t long before the witch returns to finish the job, and Kohaku is left in a sorry state. Kor attempts to undo the spell, only to shatter her Spiria in the process, and it’s off to explore the world to pick up the pieces. It goes without saying that Tales characters can often be pigeon-holed into familiar anime archetypes, though Hearts in particular puts forth less effort than usual in order to disguise it. Kor is your typical naïve protagonist that rushes into danger without thinking, Hisui is the quick to anger rival with a heart of gold, and the list goes on and on. Fortunately, the localization is incredibly entertaining, with the skits serving as some of the most humorous that have been done thus far. There are some odd name changes (such as Shing being renamed Kor), especially since what you hear and what you read vary wildly. That said, the predictable plot is so wonderfully written that you’ll often forget that you can see what’s coming a mile away. Unlike some of the more recent Tales entries, you can’t see your enemies before you engage in battle. Instead, the game adopts the more old school method of random battles and you never know which step will initiate the next fight. It’s a bit jarring in areas where you are trying to solve a puzzle, though fortunately battles are brisk. There are items that will reduce enemy encounters, though they didn’t seem to work all that well, even when trotting through weaker areas. Once in battle, you control one character, while the rest are operated by the game’s A.I. Commands can be issues to any one of them by bringing up the menu, otherwise they operate independently based on the behavior you assign them. Standard attacks are initiated with X, while all artes (your special attacks) are assigned to circle. It won’t be long before you run out of assigned spots for artes on your circle button, though the right analog stick can hold a few more. Even the touchscreen comes into play as a method to launch artes for your comrades. Wailing on enemies without care doesn’t come without risks. Eventually, a foe might turn red and unflinchingly launch an attack your way. 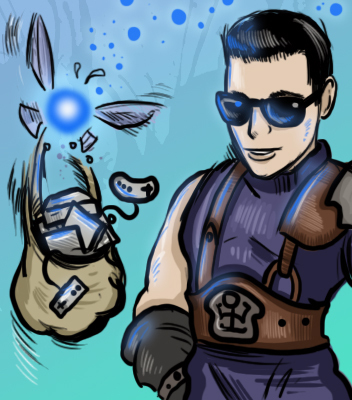 Normally, blocking with square can mitigate the damage of most attacks, but it’s in these instances where if you guard right before you get nailed by a monster, the attack is rendered ineffective and you can counter with an onslaught of your own. The timing is tricky at first, but once it clicks, the possibilities really open up. Your characters are supplied with meters measuring HP, TP, and a counter that tracks how many artes can be launched before you have to give it a rest. A Spiria Drive fills up as you inflict damage and once full, it can be executed to put the player character in a powered up state that brushes off attacks (and eventually launch a devastating Mystic Arte). 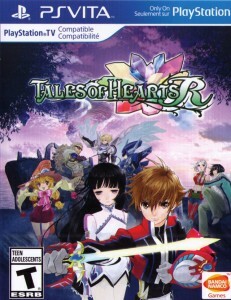 Tales of Hearts R handles three dimensional movement a bit differently, as you are no longer required to hold down a button to move to and from the background. Instead, the directional buttons move you back and forth on a two dimensional plane, whereas the left analog stick grants free roaming. The Chase system is where the combat truly shines. Attack an enemy enough and you may see blue circles encapsulate them. If you manage to keep up the onslaught, they will be momentarily stunned, allowing you to knock them into the air and then warp behind them to continue the assault all Dragon Ball Z style. If your party members happen to be sharing in the mayhem, their portrait can be tapped to launch a team attack, though there are solo special attacks that will end the combo right then and there. 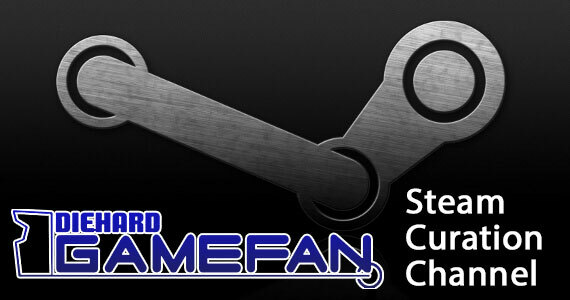 It’s an addictive system and the game really starts to shine once you gain access to it. Leveling up your character’s Soma is a bit of a mess. In fact, even after finishing the game I still don’t have a firm grasp on how to manage it properly. Upon level up, you’ll be awarded a set number of Soma Build Points (or SPB) that can be dispersed among various parameters. Depending on which ones you decide to focus on, you can build your character to fulfill certain roles and unlock new weapons, artes, skills and statistical bonuses. If you’re not meticulous, points can be automatically assigned based on pre-defined roles and you don’t have to get your hands dirty. 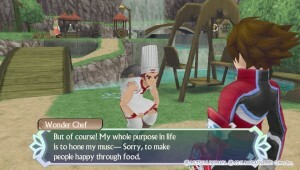 Other aspects of the game are kept rather simple though, as upgrading gear is as simple as purchasing it from the store and assigning skills and cooking food works just as it did in other games in the series. While Tales of Hearts R makes it a point to introduce new mechanics slowly, it does a terrible job of explaining how they work. You are granted a venue in which to practice and a brief explanation of what to do, but it doesn’t make clear how the timing works, so you’ll either end up skipping the tutorial altogether out of frustration or you’ll learn by fumbling through trial and error. But as I mentioned before, once it clicks, it feels like a real breakthrough and you’ll appreciate the game all the more. The transition to the Vita platform really makes for a visual delight, as you can hardly tell this used to be a Nintendo DS game. Characters animate fluidly, move their mouths when they talk, and overall function like proper three dimensional figures. There are a few anime sequences scattered about the game that look really sharp on the small screen, though it’s clear which ones were kept from the DS original (their resolution is much lower by comparison). There are occasions when you have to enter the Spiria of NPC characters to destroy the Xerom that are ailing them which could have had potential for interesting locales, though this is squandered by having an identical looking theme for each one. Ah well. Before, fans had to beg just to get the original Japanese dub, but now it’s all they get. That’s right, there is no English dub option this time around, which is perfectly acceptable as someone who can speed read through all of the dialogue anyway. The soundtrack is also very strong, with a few tracks included from other games if you happen to have the costume DLC to match. It’s a shame there wasn’t a special edition to accompany the other two that came out this year, as I would’ve loved to a CD set to play the tunes at my leisure. If you’re feeling particularly lazy, DLC can be purchased that will instantly boost your levels and increase your cash flow (as there was in the past). However, I have to emphasize that this is not required. In fact, the majority of the game is fairly easy without any sort of grinding or participating in optional side quests. A few of the bosses were tough, but they can be felled with enough careful planning. Your biggest enemy is actually going to be figuring out where to go next, as rather than pointing you to a specific location, you are instead given vague directions to your destination. And good luck remembering what you were doing if you turn the game off for an extended period of time. The game’s trophies were a bit of a grind fest though. At least new game + eases the burden after you’ve gone through it once. 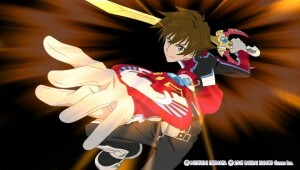 Tales of Hearts R is everything I love about JRPG’s. The story is entertaining (though incredibly cliché), the combat is enjoyable, and I grew attached to the characters despite how familiar their traits were. Which makes it a shame that the physical copies are so limited, as they can only be had through GameStop or Namco’s online store. 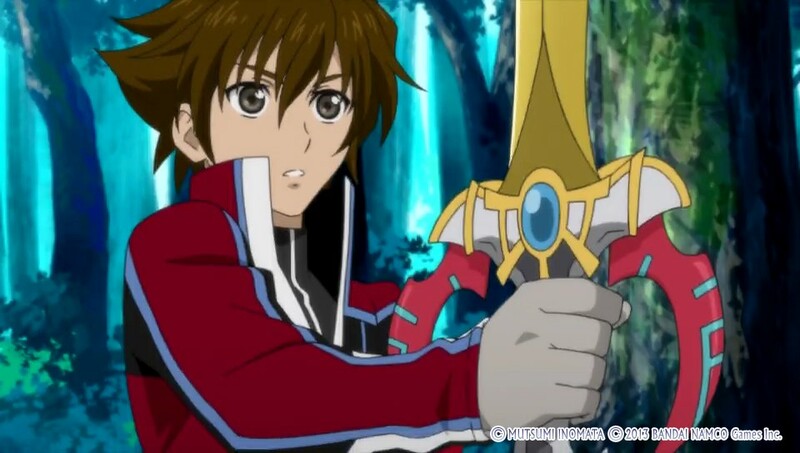 My hope is that it is successful enough to justify a localization of Tales of Innocence R as well, even though that released first. Bottom line: while the game is very “been there, done that” at times, it at least does things in such a way that I don’t mind being there and doing them again. The third Tales game of 2014 is finally out, as Tales of Hearts R attempts to make an impressive showing on the Vita. In terms of presentation, everything looks and sounds great, particularly the anime sequences that pepper the experience. Combat is fairly addictive, especially once you gain access to the Chase mechanics, and the A.I. 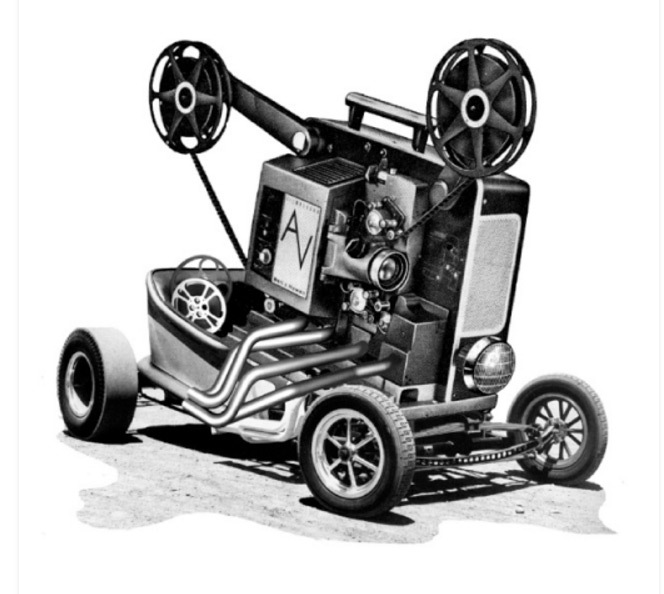 Is perfectly capable of backing you up. The tutorials aren’t all that well done though, as despite giving you a venue to practice maneuvers, they do an awful job at explaining how things are executed nor the timing on them. Also, the cast is far more archetypal than usual, with many plot points being easily predictable. Still, even if it doesn’t have an original bone in its body, Tales of Hearts R at least pulls things off well, making it a worthwhile addition to the Vita’s growing RPG library. The last paragraph is how I found it: it’s a good old fashioned Tales game with everything that comes with it (for good and bad), and I couldn’t help but enjoy it. I’m not sure I’d agree with sentiments about how the game looks, however: I found Hearts R’s visuals to be workmanlike and very bland. Despite the passable character models and town models, it has stiff animation, and dull lighting, lending it a dead look most of the time. The original’s sprites and colourful environments boast far more charm. It’s passable, but when the decade-old 2004’s Tales of Symphonia looks tonnes better you know there’s something wrong. Hearts R isn’t a bad looking game, it just could look so much better. 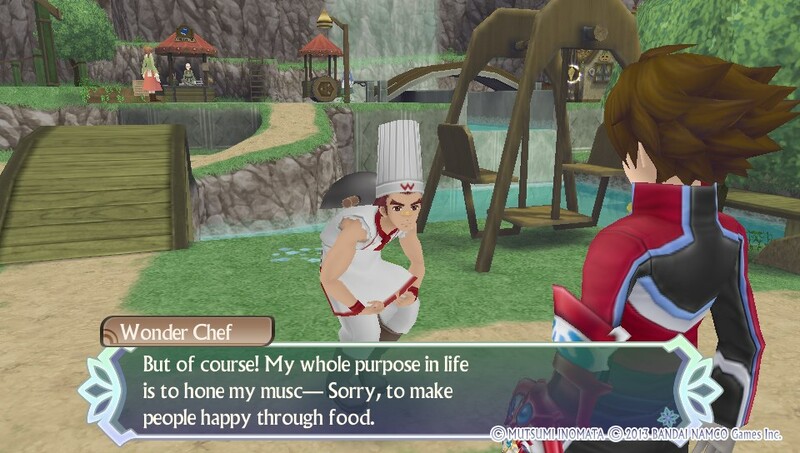 I too prefer the character models in Hearts R, just that everything else on top in Symphonia made it look scrumptious (mainly the cel shading, and the soft lighting and depth of field). I didn’t really like Hearts R. I thought the battle system was great but nothing else was. The graphics were just bad (I really don’t like complaining about graphics but these graphics are unforgivable for a PS Vita game), the plot was really uninteresting, I didn’t like any of the characters except Hisui, the OST was somewhat good but it wasn’t memorable at all (plus, almost all the battle themes sound like generic Sakuraba). But the game’s worst sin is random encounters. I don’t mind random encounters in old games but as I said before, this is the Vita, it is unforgivable to have random encounters, especially since THE ORIGINAL DS VERSION DIDN’T HAVE RANDOM ENCOUNTERS! Playing this right now as well, and I bought this to go with trying out on my newly acquired Playstation TV (I have a standard Vita, but I got the P TV on sale, and I prefer playing games on the larger screen). So, to my perspective, the game looks like a decent (if maybe a bit bland looking) PS2 title…which I personally am ok with. I imagine the smaller screen might help there for those bothered by it. Its fine, though. Beyond that, i am really enjoying this game, but I like the Tales games in general. I almost imported the European version before i found out that we were in fact getting this game in NA. Also, it plays fine on the Playstation TV. The touch functionality (like triggering some of your party members’ arts) is obviously gone, but so far hasn’t really impacted my playing at all.